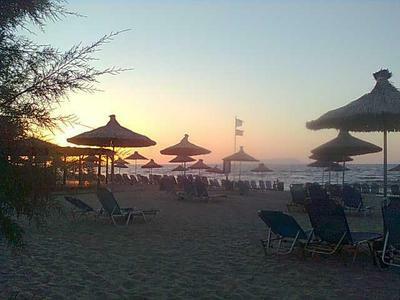 The sunsets from Anissaras beach are lovely. Dino says: "It's a beautiful beach not far from Heraklion and very close to Analipsi and Hersonissos. There are many hotels there, but it's also a quiet and pleasant village. Many families visit this beach and safely swim in its protected 'pools'. There are rocks close to the shore, so no one tends to swim out very far. The sunsets are breathtakingly beautiful from here, a sight not to be missed!" 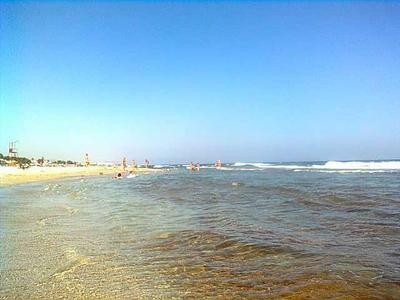 There are quite a few hotels located in this area, and the beach can be accessed by everyone. There are many rocky shelves which create little coves and perfect pools for the kids to explore. 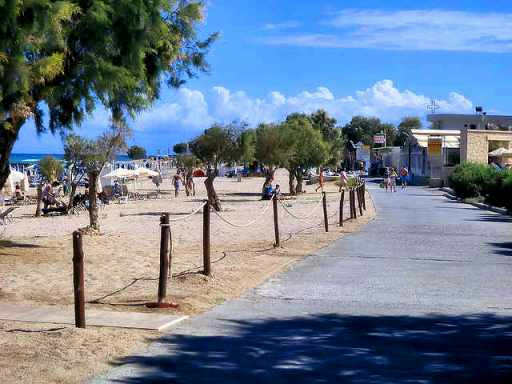 Fronting onto this beach are Aldemar Cretan Village, Anna Maria Village, the Aldemar Knossos Royal Hotel and Royal Villas, Annabelle Village Hotel, Mitsis Laguna Resort & Spa, a little further west, actually on Lyttos beach, is Hotel Serita. So you can see there are lots of resorts on this beach. The next beach to the west is Agkisaras, then Lyttos, then Analypsi. A little further to the west is Kato Gouves. To the east is a rocky point named Cape Sarandaris, then the bay widens out to become Hersonissos, one of the busiest resort beaches in the whole of Crete. On the point is a sweet little white chapel named Agios Giorgos. Analypsi has lovely beaches for swimming and a delightful little white and blue chapel named Agia Marina sitting out on the point. Close by is the Cretaquarium where the whole family will be entertained with modern displays of all the marine creatures. Nearby is the ancient site of Minoan Palace of Malia, east 15 km, with remains of a complex village dating from 1900 BC. Milatos Cave is 26 km to the east, near Sissi beaches, which are also worth a visit. Mike says "Home Hotel is an absolute gem in Anissaras. Small but perfectly formed! Worth a visit & I always describe it as a hidden Oasis!!!" Home Hotel has a real homey feel and friendly staff, reasonable rates and is a fun, family comfortable small hotel. 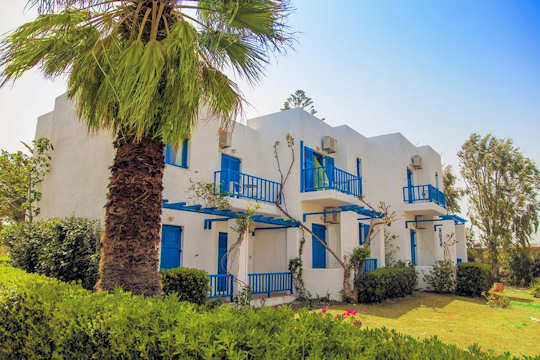 Inland are the traditional villages of Agriana, Ano Hersonissos, Koutouloufari, Piskopiano and Anopolis, where independent travellers will no doubt prefer to spend some time, here is a small cottage accommodation of Villa Fabrica - The Old Olive Press... Surrounded by olive groves and silence, the Kapsetakis family will look after you. 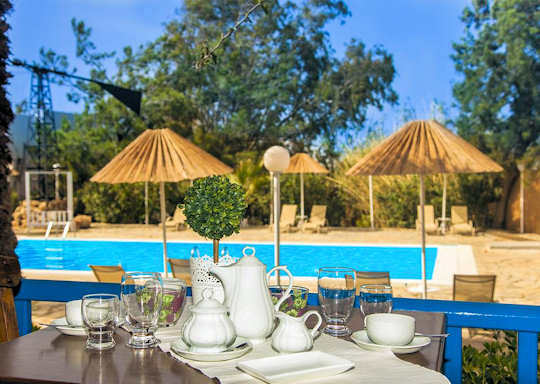 In Koutouloufari, just a little inland from the beach, is Villa Diktynna, a small family-run set of maisonettes in peace and quiet, away from the nightclub and package holiday scene. Vangelis will be sure to make you very welcome. The modern seaside Saradari Restaurant is just around the corner from Anissaras, close to Cape Sarandaris, overlooking the bay. With a wonderful light and airy atmosphere, fresh seafood and good service, it is a must for that laid back Greek dining experience, with sophisticated flair.